An innovative way to integrate micro-finance and sanitation marketing is resulting in a truly Hands-Off success story and helping to scale up access to safe toilets by the rural poor. Many proponents of market-based sanitation programs around the world are keen to explore financing as a way to make toilets more accessible to the rural poor. The most repeated complaint by rural villagers when discussing toilet adoption in Cambodia, like elsewhere, is aut louy or “no money”. Cost is also one of the major roadblocks in offering sanitation financing: loan assessment, disbursement, and payment collections are expensive activities. Because loans for toilets are relatively small, the interest (even at high rates) is not likely to offset the operating costs of the micro-finance institution (MFI). 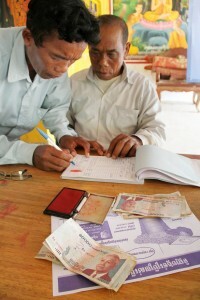 Furthermore, MFIs typically prefer to offer ‘productive’ loans as a opposed to ‘consumptive’ ones because of their lower risk of delinquency or default (a loan to buy a sewing machine for a small business that will generate revenue to make payments as opposed to a loan to repair the roof of a house). Loans to purchase toilets and water filters are considered consumptive. Due to the high cost of operations and the perceived risk of consumptive loans, many MFIs have received grants to subsidize loans that enable poor households to purchase socially ‘good’ products such as bio-digesters, water filters, lighting products, efficient cookstoves, and toilets. This approach can generate additional product uptake but its main drawback is the lack of sustainability: rather than seeking greater efficiencies in their operations, rationalizing their costs, or building new revenue streams, MFIs can grow dependent on short term grants and NGO support. In January 2013, WaterSHED introduced a new model of WASH Loans in partnership with the MFI VisionFund. Instead of subsidizing the MFI, WaterSHED encouraged VisionFund to charge a loan origination fee in the form of an interchange fee to offset its operating costs. The fee is similar to the interchange fee paid by merchants around the world who accept payment cards such as VISA or Mastercard, and is typically around 2 percent of the purchase price. Also following the payment card model, VisionFund pays the toilet seller directly instead of disbursing the loan to the consumer. 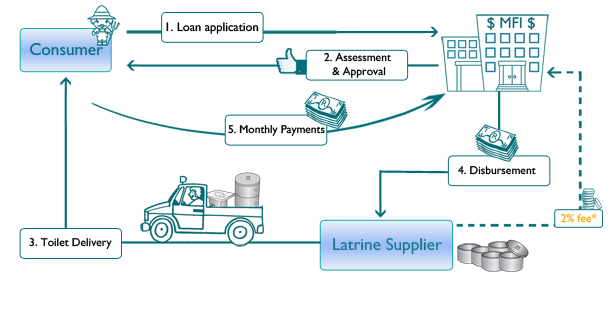 WASH Loan process. *The interchange fee is deducted from the disbursement automatically. In 9 months more than 1,237 loans have been approved and disbursed to 29 participating toilet suppliers who, in turn, delivered new latrines to customers. The uptake is continuing to accelerate. From the customer’s perspective, being able to make payments over time instead of in one lump sum can mean the difference of adopting a latrine or continuing open defecation. From the merchant’s perspective, paying the MFI roughly 2 percent of the retail cost of the toilet (automatically deducted by the MFI from the disbursement) in order to sell many more is well worth it. There is also an additional advantage in that collections are made much simpler and cheaper for the toilet supplier – they are transferred directly by the MFI. VisionFund is keen to expand the program using the concept of interchange fees, which was previously not used. The fees represent a new revenue stream that enables greater and faster expansion of MFI financial product offerings, while at the same time making MFIs more accountable to their customers (i.e. suppliers and consumers) – rather than to donors. WaterSHED’s Hands-Off philosophy leads it to promote solutions that minimize the role of outside donors and NGOs with the dual goals of increased sustainability and replicability. Since January 2011 the Hands-Off sanitation marketing project has enabled the sale of more than 55,000 toilets to rural consumers by roughly 160 partner local enterprises. The program has also been a vehicle for hygiene and sanitation messages to more than 120,000 villagers who have participated in group sales events. WASH Loans, the integration of micro-finance with WaterSHED’s WASH marketing program, supports the strategy of increasing market penetration of essential products such as safe latrines and water filters by lowering the barriers to purchase. The program is based on initial testing between October 2011 and December 2012 in which WaterSHED substantiated the demand for consumer finance officers presented during sanitation marketing group sales events. During that study period, 27.4% of the total participants applied for a loan for a latrine or indicated their intent to apply for one in the future. This entry was posted in East Asia & Pacific, Economic Benefits and tagged Cambodia, changing behaviour, finance, micofinance, WaterSHED. Bookmark the permalink.